Do not adjust your eyes…these two bikes are new Triumph cruisers, not Harley-Davidsons; one of which will be launched shortly as a rival to the Harley-Davidson Road King, the other has been disguised as a Harley Electra-Glide. Look closely and you will see the engine is the parallel-twin from the Triumph Thunderbird in both of these bikes – the engine that was first seen in the Thunderbird in 2009 and is available in both standard 1600cc and 1700cc big-bore variants. These bikes may be testing on the road at the same time but it appears they are at very different stages of development and we will break that down and split it between the different bikes to explain what is going on. 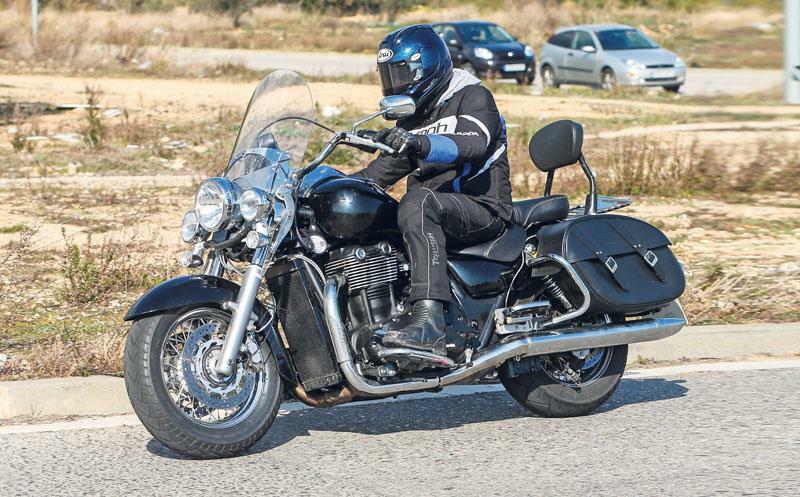 Triumph has made no secret of the firm’s ambitions to expand sales in the huge global cruiser market and test riders in Spain have been spotted bench-marking Harley-Davidson’s in the past alongside the Triumph test bikes. It seems now Triumph has taken the new step of trying to disguise on of the early mules by bolting on Harley-Davidson Electra-Glide body work and panniers. This is the bike we will be seeing on sale a long time before the other bike and it will slot in at the top of the Thunderbird range as a direct rival to the classic Harley-Davidson Road King. The Road King has been a staple of the Harley touring range since it first appeared in the 1980s before a big overhaul in 2009 and it continues to sell well around the world; Triumph is desperate to grab a slice of this lucrative market and sees it as an invaluable way of increasing the American market share. Triumph's take on the Harley Road King Classic has similarities to its American rival which are impossible to ignore. The large central headlight flanked by twin supplementary lamps, with indicators hanging underneath them, could have come from the Harley parts bin. The same goes for the tall, windscreen, footboards and double-buckled leather panniers. But all those parts are already in the Triumph options catalogue. Where the new bike gets even closer to the Harley is in the more fundamental styling changes. The front forks are new, and further apart to accommodate a wider, 17-inch wire-spoked rim instead of the standard Thunderbird's 19-inch alloy. The front mudguard is deeper and covers more of the wheel, rather like the Harley's, while the rear fender is much longer instead of the cut-off style of the stock Triumph. Again, just like the Harley's. The passengers also get footboards instead of pegs, although on this prototype their mounting brackets seem lashed-up, suggesting Triumph is still experimenting with their final positions. The bars are also new, and shaped just like the Road King's. 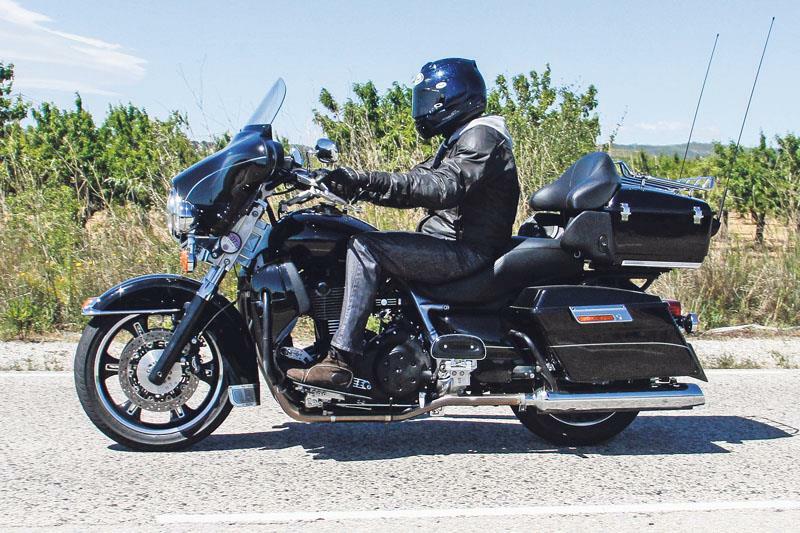 While the standard Thunderbird uses Triumph's 1597cc parallel twin, the new Road King-style bike is fitted with the bigger, 1699cc motor from the Thunderbird Storm, producing 97bhp instead of 85bhp. We expect this bike to appear either very late in 2013 or early to mid 2014. 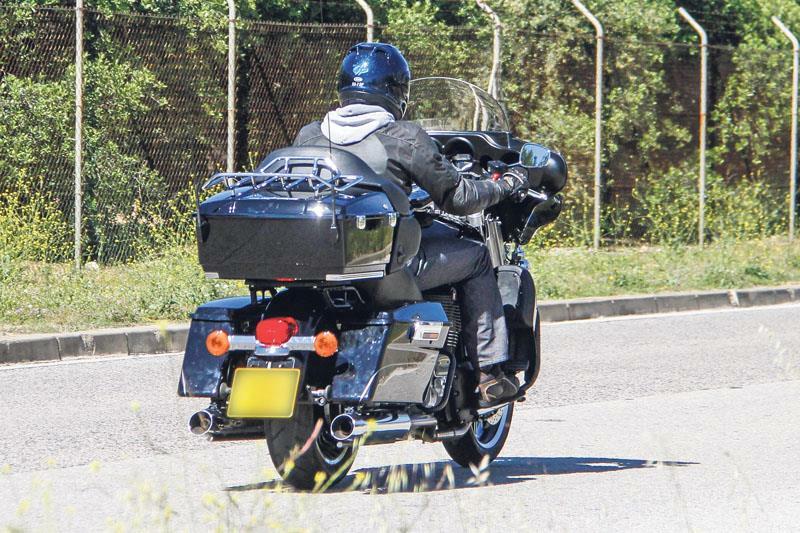 MCN has already shown images of Triumph's other new T-Bird, aimed at Harley's Fat Boy and at that time Triumph's test riders were in convoy with a real Fat Boy – so there's no doubt that's the bike they're aiming at. The only model we haven’t seen in what looks likely to be three new cruisers is the fully-dressed Electra Glide rival…until now. Triumph has been extremely busy over the past five years and has transformed the model range on sale but don’t think the firm is going to be bringing out an exact clone of the Harley Electra Glide – this is a testing mule that has stolen a load of Harley parts to keep it under disguise. 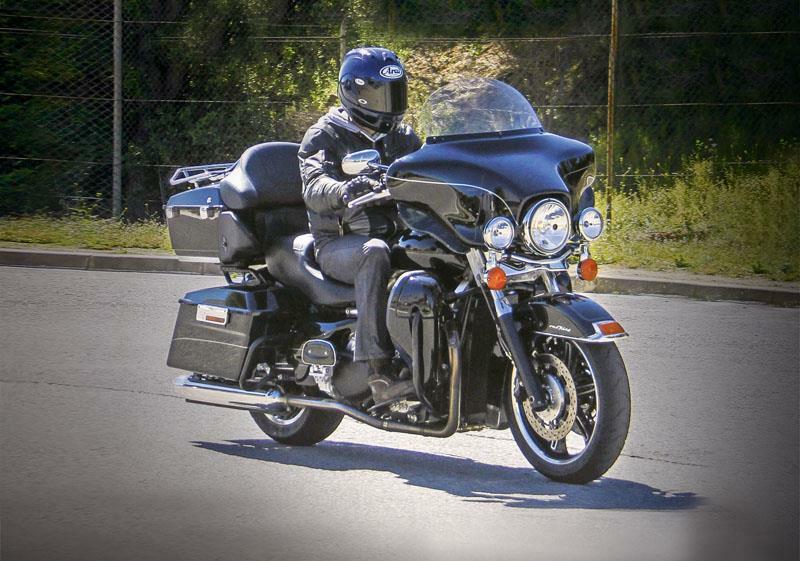 At the moment, according to insiders, any potential new rival to the Electra Glide is still years away and styling issues have not been addressed yet; this bike is out there testing on the road to put chassis, suspension and engines through testing procedures. This bike was such a convincing replica of an Electra Glide that when the first low resolution versions of the images were sent, complete with watermarking by the spy photographer, it looked like Triumph had either copied the Harley exactly or was running one on the road to benchmark it. It was only when the higher resolution images were sourced the parallel twin Triumph motor could be seen hidden under real Harley bodywork. There are no firm clues as to when this bike will appear or any ideas as to what it will look like but it’s going to be a number of years yet.